Enhanced Abilities: The Unicorn has super human strength, and endurance. Body Armour: The Unicorn’s soft tissues are dozens of times harder than those of an ordinary human, making him highly resistant to physical injury. Power Horn: The Unicorn wears headgear equipped with an energy projector that tunes to various frequency and power levels. This allows him to project force beams and thermal beams. It also allows him to project a force field and to levitate objects magnetically. Rocket Belt: The Unicorn also wears a rocket belt equipped with twin, high-efficiency electric micro turbines that allow him to fly. Milos Masaryk was a Soviet intelligence agent assigned to security duty at the private laboratory of inventor Anton Vanko. Vanko was engaged in the development of advanced technological weaponry and armament. 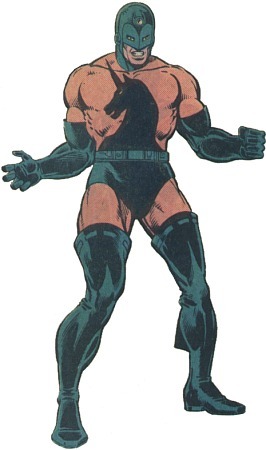 His first completed project was a full body suit of armour which he himself would later wear as the Soviet operative code-named the Crimson Dynamo. His second finished project was a helmet and harness into which offensive radiation-beam weaponry called a “power horn" was integrated. Vanko offered this invention to Masaryk, and with government approval, began to instruct the Soviet agent on its use. Some time after Professor Vanko defected to America, the Soviet government dispatched Masaryk to avenge the disgrace caused by the inventor. Masaryk was given a special, heavily insulated costume and code-named the Unicorn because of the head-mounted discharge cone of the weapons system he wore.